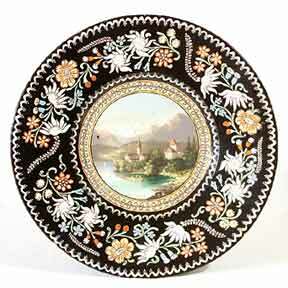 Thoune scenic plate II - 9¾" (247 mm) diameter. Thoune, Thun, Thonne, Thuner Majolika - all the same thing; pottery from the place previously known as Heimberg in Switzerland. It is pronounced 'toon' as in Roger Rabbit. It is attractive and highly distinctive intricately slip-decorated earthenware. The colours used are white, green, yellow, orange and blue, usually on a dark slip background which is often a deep, rich brown. Many companies made Thoune pottery, mostly small concerns. A couple of dozen are still operating. The most sought-after artist potter is Johann Wanzenried, who was active in the nineteenth century.